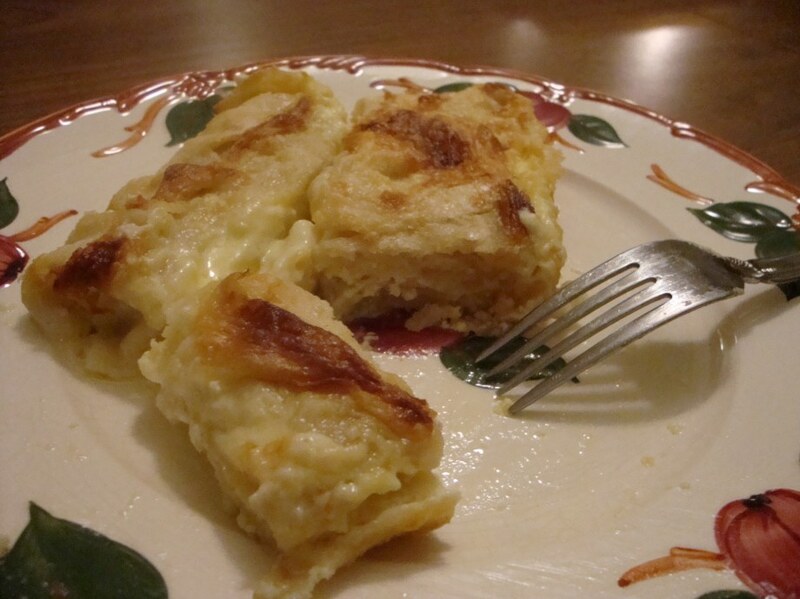 Zagorski Strukli, a traditional Croatian comfort food, pillowy cheese dumplings baked with cream. In a large mixing bowl make a dough from the flour, 1 egg, oil, and salt. Add water a bit at a time, until dough comes together. Or use the well method by mounding flour onto a clean surface. Using your hands, make a well-like indentation in the center of the flour. Add egg, oil, salt and a small amount of water to the well. Starting in the center, draw some flour into the well and mix in. Keep drawing flour into the well a bit at a time, adding more water as needed, until dough forms a ball. Knead the dough until bubbles start to form and the dough becomes smooth. Shape into a ball and coat the surface with cooking spray or a thin film of vegetable oil to prevent it from drying out. Cover with a clean cloth and let stand about 15 minutes. While the dough is resting, make the filling. In a large bowl, mix the cheese with the remaining 4 eggs. Add ½ cup of the melted butter. Blend until the mixture is smooth. Sprinkle a large work surface such as a kitchen table with flour. Roll out the dough to paper-thin thickness. Then spread the cheese mixture evenly over the dough. Drizzle with ½ cup melted butter. Roll up jellyroll fashion. Cut the roll into 20 pieces (the cutting is traditionally done with the rim of a plate). Boil the strukli in salted water for about 10 minutes. Drain and arrange in a greased ovenproof dish. Preheat oven to 400°f. Pour the remaining ½ cup butter over the štrukli and top with cream. Bake for 20 to 30 minutes until golden. Struklji are a Slovene national dish. The region they are historically from also extends into Zagorje (in Croatia), but can in no way be defined as “traditional Croatian comfort food”. But good effort. It’s a Serbian traditional food not Croatian at all.